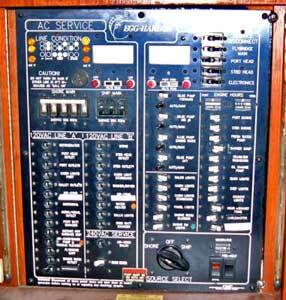 It has become apparent that the electrical panel will need some changes. Currently there are only (2) 230 volt breakers. With the items being installed on the boat, we will need a total of (8) 230 volt breakers. We are in hopes that the service to the boat will not need to be increased - but the final determination has not been made. Adding an amp gauge will help us to monitor usage. 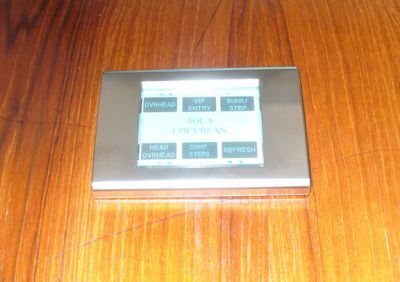 An amp gauge can also help alert us to any unusual draw, indicating a problem. I had this happen to me on the Post and consider the amp gauge a very useful instrument. The Post had a very minor leak in the air conditioning system and I could tell it from the draw. I then added an additional charge. We've determined that we need more power and a lot more breakers. We decided to add a second 50 AMP service to the boat. The problem is: where do we put the additional breakers? The people at Bass gave us the solution and more. Utilizing the E-PLEX system from Airpax, they will not only be able to give us the sevice we need within the current space, but give us monitoring and system checks that we did not know were possible. We will be able to monitor the engine room temperature, if the bait freezer is operating properly, what AMP usage is for any other given appliance or unit. The system allows us to add items now or at a later time. In addition to all of this, they are nice people! The news just keeps getting better. 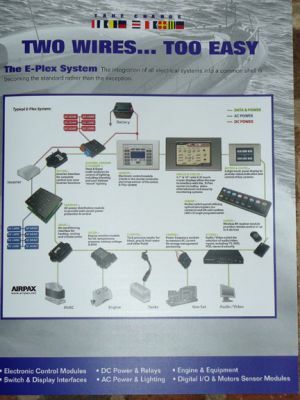 The E-PLEX system is simple and logical. It will also consolidate our current configuration of two panels into one, while giving us more, more, more. We were worried about finding room for larger panels, and now thanks to Bass and the E-PLEX system, we have more storage space. In addition to the E-PLEX system making wiring the boat easier and monitoring everything from water tank levels to engines, we believe a major factor to consider is the added saftey afforded. The system has message alerts that will tell you if a potential problem exists and you do not have to be in the salon to know it. We will have a monitor on the bridge console! The system can even be set up to call you on the phone to alert you. 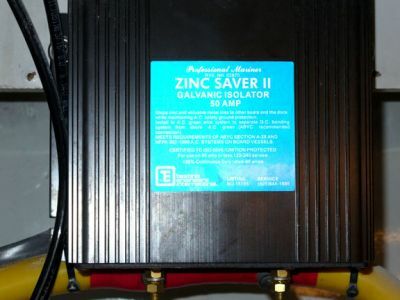 This is the existing galvanic isolator that came on the boat. We knew that when adding the second 50 amp service we also wanted a second isolator. What we did not know before doing research on the subject was the differences in units made by the various manufactures. We also did not know the true importance. Now that we know, we want you to know and have a fail safe from DEI installed on your boat for your family's safety. 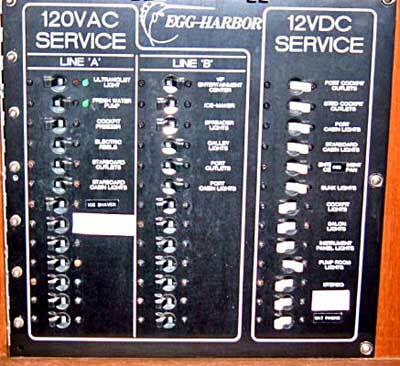 We are replacing this existing with DEI and adding one for the new 50amp line comming on the boat. 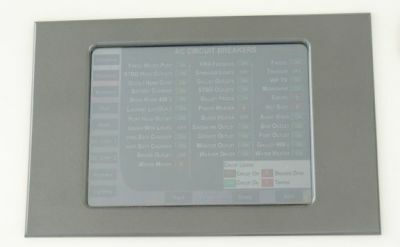 Here is the E-Plex touch screen monitor installed on the bridge console. 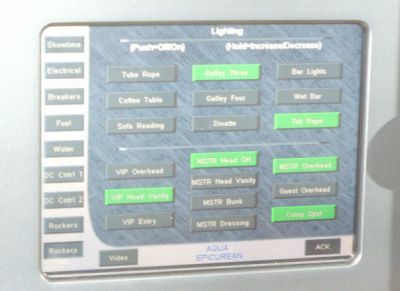 With this screen we can monitor all electrical activities going on in the boat from the bridge. 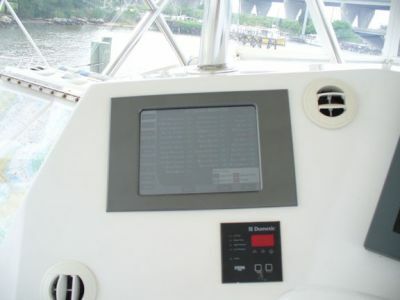 The screen can also be used to view videos, cameras in cockpit or engine room, computer or Garmin. 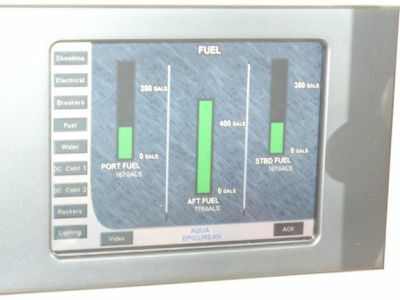 The display will also display information such as the fuel tank levels, engine room temperature and bilge pump activities. 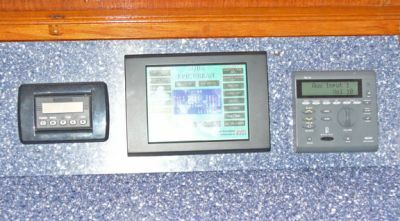 This monitor will enable us to check virtually anything on the boat from the Master Stateroom including the cockpit cameras. We really like the secure feeling this entire system gives us. If we see someone trying to get on the boat or doing something they should not be doing on the pier, etc. we can blow the horn (Buell triples that will scare the bejeesus out of them) and turn on the spreader lights (1500 watts each) all from the security of our Master Stateroom. We can also watch TV or video while we take a bath! 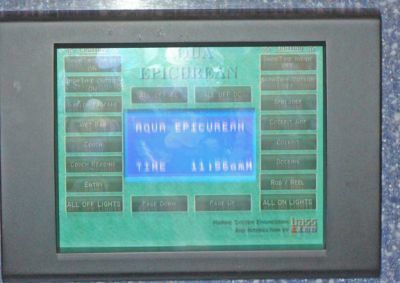 Tom, from Bass Electric, has programmed the Clock and the E-Plex system is up and running. When entering the boat we can now push one button that will turn on a light in every room of the boat or a button to turn on exterior lights. 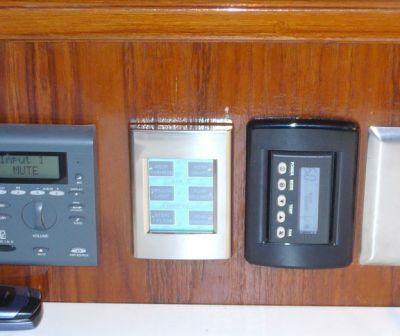 We can also push one button to turn off all lights when leaving the boat. 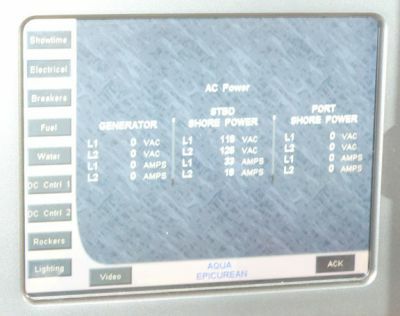 At a glance we can read what amps the boat is drawing and how much fuel and water we have on board. 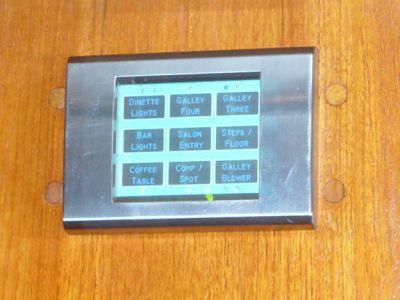 This pad over the galley bar controls nine items including lighting our way to the staterooms. 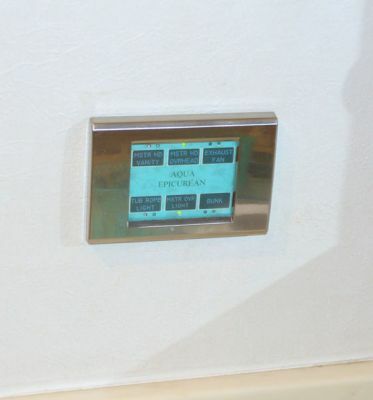 This pad over the master door allows us to turn off the lights leading to the salon and turn on lights in the master including a light in the master head. From this pad located next to the master bed we can turn on the light in the master head. We can also know if someone has turned on the salon floor/companionway step lights. This pad located in the master head controls six items including floor light in the master so we do not stumble in the dark returning to our bed. 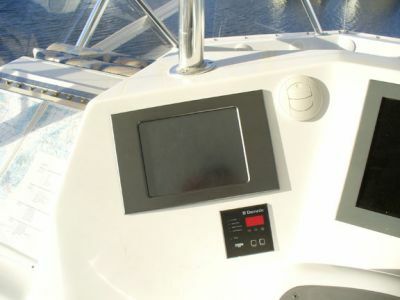 Located in the master head is this ten inch touch screen that gives us all vital information on the boat and the ability to turn on or off almost every breaker on the boat. 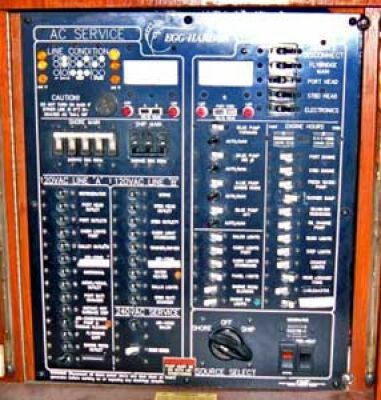 Shown in this picture are the DC switches. Touching the screen gives us the page that displays fuel levels on board. Now we know if we need to set the alarm to wake up earlier to get fuel for our trip. 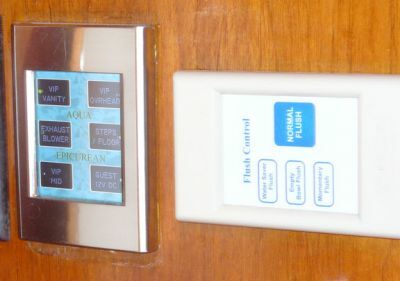 Touch the screen again and we can display if you have enough water to take that shower or if we have to turn on the watermaker, which we can do from this screen. We can also see how many amps we are drawing and know if we may need to plug in the second 50amp cord so everyone getting ready to go out to dinner can use hair dryers. 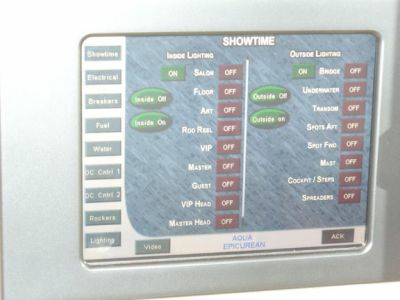 Once we are ready to go out the touch of a button can make the boat ready with preselected outside lights turned on and interior lights as well. We have been asked "why have this in the master head?" 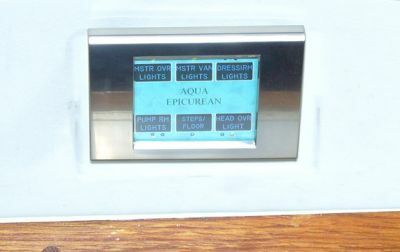 On this boat we have the 450 Clock in the salon giving us vital info useful during plug in docking and leaving the boat. 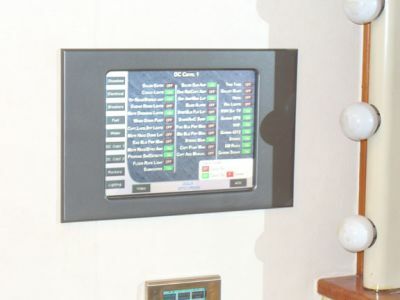 We also have the 350 touch-screen on the bridge giving not only vital info but the ability to turn on/off items while running the boat without leaving the bridge. The screen in the master head allows us the ability to monitor and react on situations from our room. This is peace of mind for us. Waking in the middle of the night we can know if the spreader lights were left on or if the Eskimo Icemaker is making-ready for our morning fishing trip. 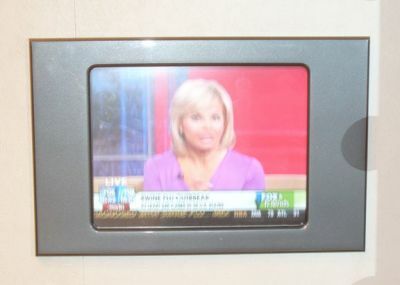 Or .... we can touch the screen to watch video from the KVH or see the view from one of the cameras on board. 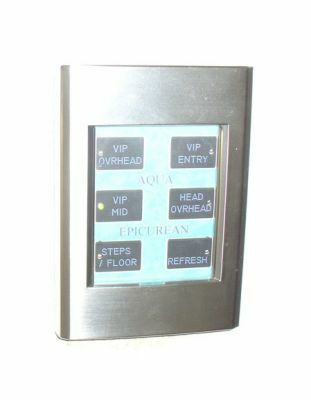 From this touch pad at the entry of the VIP Stateroom, you can turn on all lights in the room, light your way to the Galley for a midnight drink/snack, or turn on lights in the Head. You may also force fresh air into the room with the air refresh button, which activates a fan on the Bridge. This touch pad is just above our heads while laying in bed. There is no need to get up or even sit up to turn lights on or off. When the Head overhead light is lit, we can tell if the Head is occupied. The pad in the VIP/Guest Head can light the VIP Stateroom, the Guest Stateroom or the companionway in addition to the Head itself. It also controls the exhaust fan. 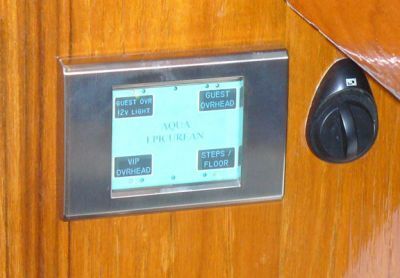 The touch pad in the Guest Stateroom is located next to the volume control for the Polyplaner speakers. We can tell if someone is in the Head if the indicator light is on. 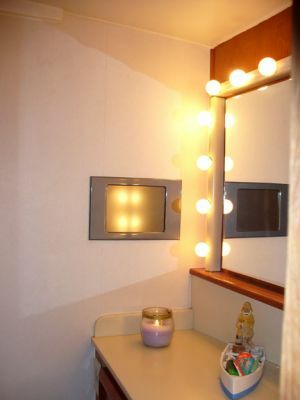 As with all of the Stateroom pads, you can light your way to the Salon/Galley or to the Head as well as turn on room lights. This touchscreen on the Bridge has the same attributes as the one in the Master Head. 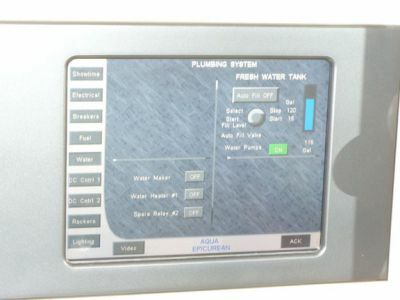 It gives me access to information such as amp draw, fuel levels, water levels, etc. It also can be used to monitor the Engine Room camera or watch SAT/TV. 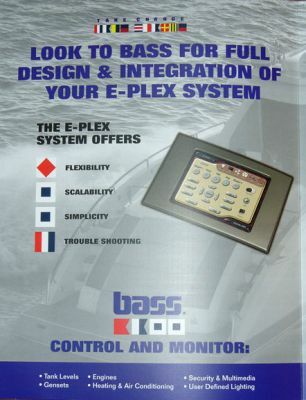 FUNCTION: With E-Plex system including this touch-screen on the Bridge we have the ability to turn off/on almost any breaker on the boat without leaving it. We believe this to be a very important saftey edge.